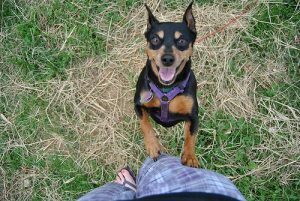 We love to see our dogs excited and waggy-tailed but allowing them to jump up at people can quickly become a nuisance. No one wants to see their pooch excitedly – and entirely accidentally – knock over a child or send granny flying. So how do you stop your dog jumping up? Getting into good habits early on makes things much, much easier. And that goes for owner habits as well as dogs! Setting some house rules before your furry friend arrives is important to ensure all the family are singing from the same hymn sheet. If some family members try to stop the jumping and others turn a blind eye, it can be very confusing and unsettling for your dog. With consistency from the whole family, your puppy should quickly start to understand that jumping up is not rewarded, and I don’t just mean with treats! Attention can be the biggest reward of all for your puppy. If jumping is allowed, your pup will very quickly learn that if they jump up, they receive pats and attention and people talk to them. Great! All of your puppy’s favourite things! Unfortunately though, that’s only going to result in one thing – lots and lots of jumping, which may be cute now but won’t be so adorable when your pup is a full grown dog capable of knocking people over! When your pup jumps up, ignore him. Completely. We’re talking crossed arms, looking away kind of ignoring. Wait for all four paws to be on the floor and THEN reward with heaps of pats, scratches and repeats of “good dog!”. Just like before, the connection will very quickly be made – “when I jump up, I get ignored but when I stay on the floor, I get lots of love” – suddenly, staying with all four paws on the floor seems like a great idea! 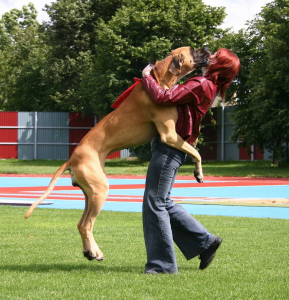 So you’ve got a fully grown dog who has been jumping up for years now? Don’t worry, all is not lost! Granted, it won’t be as easy as with a puppy but you can definitely train your older pooch to stop jumping, using the same principles as with a puppy! Consistency is key – have I mentioned that?! As with a puppy, the whole family needs to be responding the same way to the jumping up or training will be very, very difficult. This can be more difficult with older dogs as you have to break lots of bad habits – not just the dog’s but also all the family members too. The process is the same as with a pup – when your doggo jumps up, you ignore, cross your arms and even turn your back if needs be. 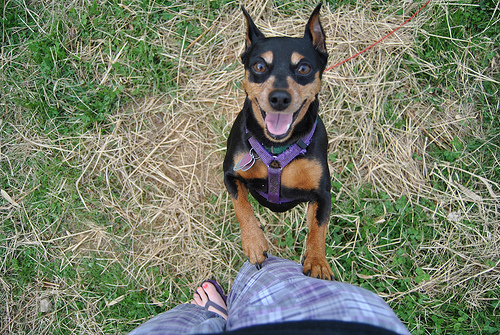 Once all four paws are firmly planted on the floor, go crazy with praise, treats and pats. If he starts jumping up again, cross arms and ignore. If all the family are doing this consistently, it shouldn’t take long for your doggo to catch on. Check out our other blog posts about stopping your dog chewing and eating too fast. Does your doggo have an annoying habit you’d like to fix? Let us know in the comments below and we could write a blog post about it! Is Your Dog Constantly Scratching Themselves?